OHIO (1888) The 195 ton 93 foot wooden bark Ohio (Little Ohie) was driven ashore and lost south of Cape Lisburne near Point Hope at 9 p.m. October 3, 1888. The vessel was under the command of captain George E. Allen during a strong snow storm when she struck the beach 60 feet from shore. Of the crew of thirty-three, fifteen reached shore. The other eighteen perished in the frozen waters as the Little Ohie went to pieces. Three of the crew that reached shore froze to death on the beach. The remaining twelve crewmen found their way to Point Hope Station where they spent the winter. 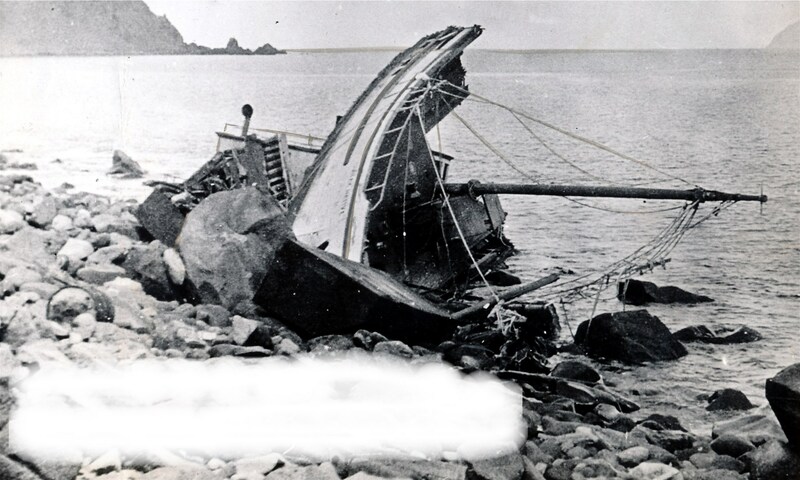 Four of those survivors perished in an attempt to reach the whaling bark Narwhale. The whaling bark Belvedere arrived at Point Hope June 28, 1899 and took the last of the survivors on board and transported them to St. Michael. Only eight of the 33 crewmen survived. The cargo of the Ohio at the time of the disaster was 50 tons of provisions, bone and oil worth $11,000. The Ohio was valued at $10,000. Both the vessel and her cargo were lost. The wreck was attributed to a thick snowstorm and heavy gale. The 25 crewmembers who were lost included Captain George E Allen (51) of Boston, 1st Mate Thomas E. Pease (frozen and died on the beach), 2nd Mate Thomas H. Niles (frozen and died at Pt Hope Station), 3rd Mate Manuel Lopez (disappeared long boat capsized), 4th Mate Joseph Enos (disappeared long boat capsized), Boat header Alexander Omey (shot himself), Boat steerer Peter Gomez, Boat steerer Samuel Brown, Boat steerer John Rogers, Cook E W Hirst, Steward Henry C Jobit, Engineer John A Maher and Cooper Peter Murphy. The eight crewmen who survived the disaster were Anton Rodrique, Edward Mason, W.E. Tait, James Roy, Frederick W Swartz, Enos Yaco, Pleas Perez and Samuel Brown. OLIVER CROCKER (1871) The 305 ton wooden whaling bark Oliver Crocker was abandoned in the ice around Point Belcher September 14, 1871. Home Port for the vessel was New Bedford, Massachusetts. She was valued at $48,000 at the time of the disaster. ONWARD (1876) The 339 ton wooden bark Onward was abandoned in the ice northeast of Point Barrow September 12, 1876. The vessel was in the whaling trade out of New Bedford, Massachusetts captained by Ezra B Lapham. She was carrying 1,400 barrels of whale oil and 14,000 lbs. of whale bone worth $67,000 at the time of the disaster. The Onward was valued at $40,000. ORCA (1897) The 628 ton three masted steam whaling bark Orca was crushed by ice and lost at the Sea Horse Islands off Point Franklin September 21, 1897. The crew was rescued by the Belvedere and later walked 100 miles to Point Barrow to overwinter. The Orca had departed San Francisco March 30, 1897 for whaling in the Arctic. She was valued at $100,000 with cargo at the time of her loss. The cargo of whale oil, bone and supplies was salvaged.